I love to collect things that have a story, especially tools used in the kitchen that are rooted in family history. For instance, I have the original butter churn that my great grandmother used to make all her homemade butters. And below, this mortar and pestle has been a cherished piece for as long as I can remember. Now the butter churn has become more of a nostalgic decorative piece but the mortar and pestle is fully used. That is where this particular food story begins. After reading through “Ottolenghi” one of many Yotam Ottolenghi cookbooks I became inspired by the use of Cardamom in a his Pistachio Cookies. I was really intrigued by the recipe calling for the pods and the process of preparing the spice start to finish. This mindful way of presence in the kitchen is extremely appealing to me. With life being so fast paced and accessible I wonder if anyone even bothers to take the time anymore. I hope so. Anyway, I started brain tossing ideas for a Valentine treat and somehow Pop Tarts came through. I thought this spice would fit nicely as the secret ingredient in this adventure. Cardamom is so beautifully aromatic and can fill a room. I used to love to grind up my own herbal spice blends so this preparation brought the past to the present. Check out this Seed Plant Water Grow favorite…Homemade Herbal Spice Soda. Anyway, it was nice to back into the groove. In a Food Processor add Flour, Sugar, Salt, crushed Cardamom Seeds, 6 tbsp of cold Butter and 4 tbsp of cold Water. Blitz till it either forms a pebble like texture or the resemblance of a dough. Add the remaining Butter or Water as necessary till you have a dough like texture or it balls into a dough in the Food Processor. Place contents onto a piece of plastic or parchment and lightly knead. Wrap it up and place in the refrigerator for 2 hours. Now this is how I got started with the pastry portion of this food story but the reality is you may have your own recipe or you may even keep store bought pie dough on hand and prefer that route instead of whipping it up from scratch. Seriously just use whatever you like. After the dough has chilled I like to roll it out a few sections at a time, meaning, just break a piece of the dough off to roll. This way I find is more manageable. And if you’re short on time and have a Kitchen Aid Pasta attachment use that to get your pieces nice and flat. From there you can roller pin easy into a thinner design and carve out or stamp out whatever shape you like. I used a square cutter to make mine but if you prefer a traditional Pop Tart shape then go for it. Once you have your carved pieces, add a dollop of Strawberry Jam to the center. Store bought works great but if you’d like to try a yummy version form scratch, check out this Seed Plant Water Grow recipe…Tarragon Strawberry Jam. Next, add a little water to the edges of the square cut dough then add another piece on top and seal the edges together. Use a fork to create the trademark pattern. Pop these into the oven at 375 degrees for 22-25 minutes. While they’re baking add a few tbsp’s of the Beet Juice and a healthy dose of Powdered Sugar into a mixer bowl and blitz away. You don’t want it to be too fluid or too thick just somewhere in between. Sorry about not listing a specific recipe here but I truly love to wing these kinds of things. Just add a little here and there of each till you get the consistency you want. Place in a piping bag or small storage container and set aside. 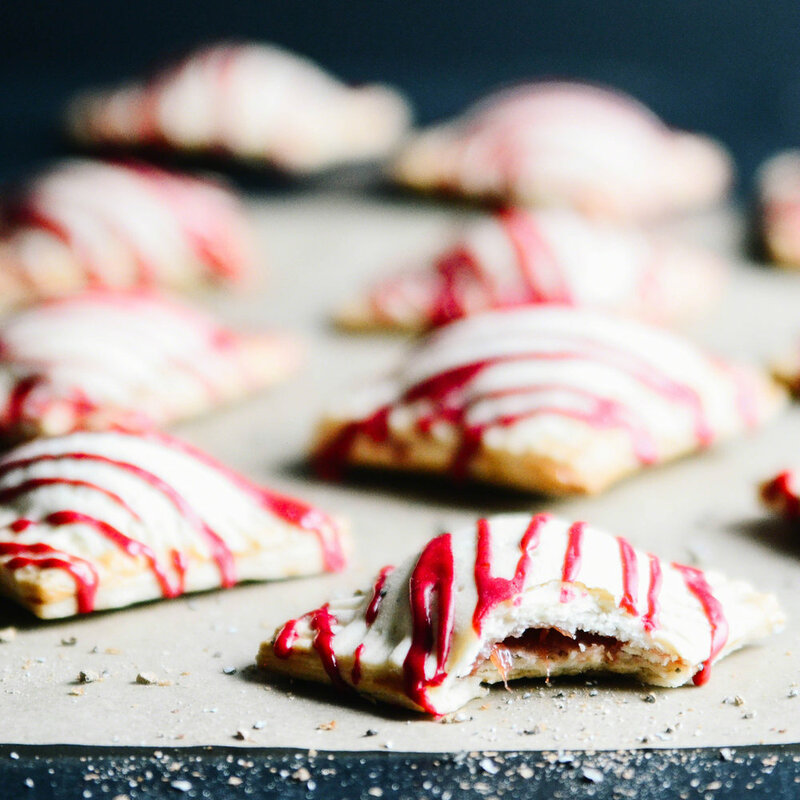 Once the Pocket Tarts are done and have cooled for 15 minutes, you’re ready to rock the Beet Juice Glaze. Pick any pattern you like and get super creative.